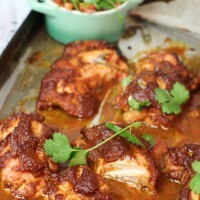 Mexican Inspired Chicken with Dates! I am not sure if dates have ever been quite as popular as they are at the moment. They are being used as a substitute for raw and refined sugars quite a lot, like this delicious caramel and dark chocolate slice I made here or this amazing date and custard tart. Have you been cooking with dates? I recently wrote a whole lot of recipes using dates including a few savoury ones like this Mexican Inspired Chicken with Dates. Doesn’t it look delicious?. Dates take on flavours very easily and their texture when cooked down forms a great paste. They are actually extremely delicious with spices and chilli. It’s sweet and spicy and flecked with chillies and all goes together so well. Add cheese or sour cream if you like. Dates grow on palm trees and were thought to have originally grown along the banks of the Nile and Euphrates Rivers in Egypt and Mesopotamia, but are now grown on every continent on earth. 100 gm of dates is approximately 277 calories but along with the calories are much needed dietary fibre, vitamins, minerals and antioxidants. I have an Egyptian friend who enthrals me with tales of growing up in Egypt where the dates are huge and plump and are made into dozens of varieties of pastries. 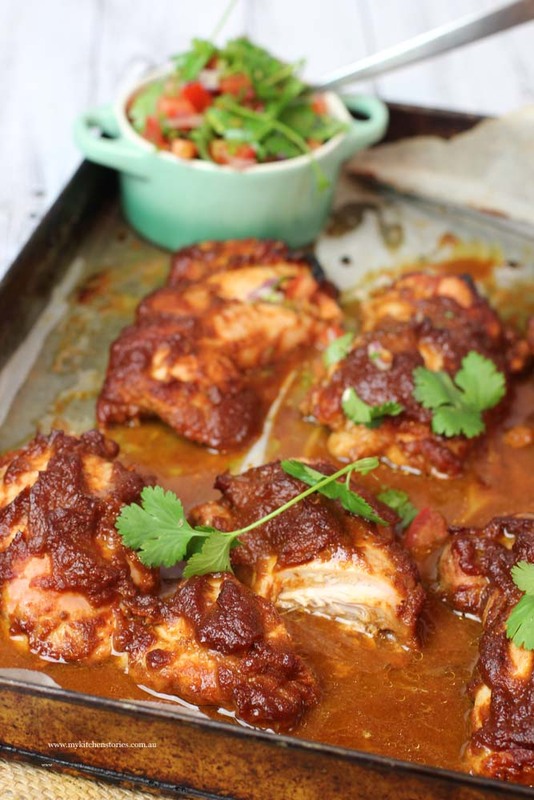 So the dates fresh or dried for this recipe are melted down into the ultimate spicy, herby sweet yet savoury paste for this tender chicken. 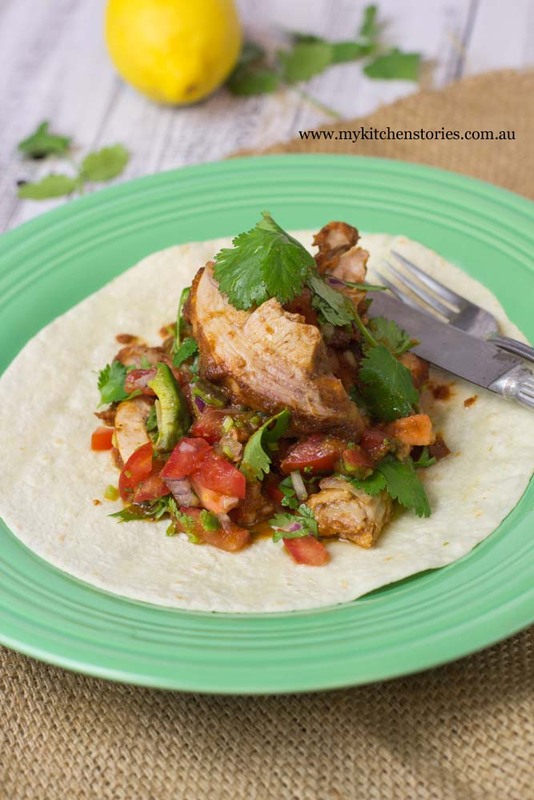 It is completely delicious with a fresh salsa containing lime and coriander. It is totally perfect served in burritos as a wrap or rolled up and baked. You could also serve it with some Mexican inspired rice. You could even save it for the next day for lunch rolls or burritos, honestly it’s plain damn delicious. Just make sure you eat it with loads of chillies. 1 small avocado diced. diced. Set the oven to 190-200 C/ 400 F. Prepare an oven tray lined with baking paper. To start put the dates, spices, chipotle salsa, salt, vinegar and tomatoes into a medium pot and put on a low heat. Stir and squash the dates as they heat. They need to break down and purée into the sauce. Taste it and add salt if needed. Set aside to cool a bit . Bake the chicken for 15 - 20 minutes. Test one of the thighs in the thickest part to ensure they are cooked through. if a little pink put back into the oven for another 5-8 minutes. 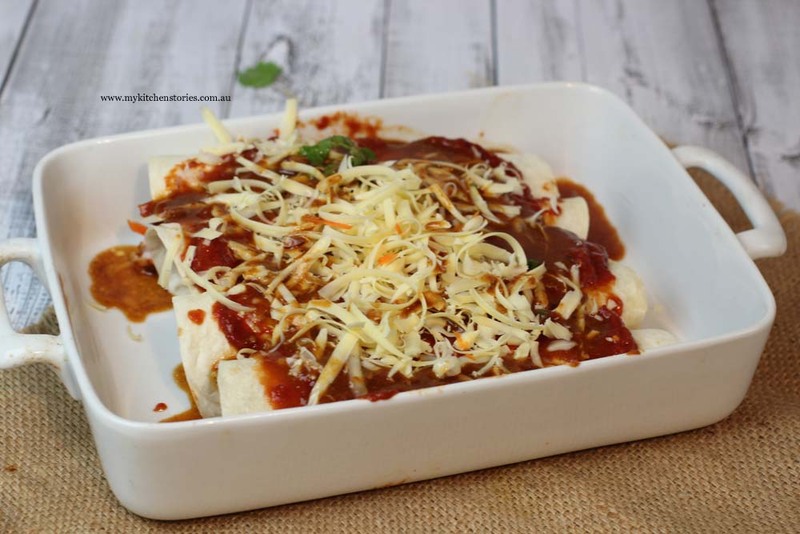 Serve the chicken with burritos and salsa and grated cheese. I like to Dice the onion and stand in boiling water for two minutes to take out the heat, before draining and adding to the salsa. This cuts some of the burn. Anything is on the table Angie! You had me at dates! I love baking with them, haven’t ventured into the savoury side of date baking before but you’ve got me feeling very tempted. Thanks for sharing some of your beautiful deliciousness over at FFF’s! Dates are great and this looks ah-mazing! What a winner of a dinner! Wouldn’t have thought to use dates in a dish like this. Looks so flavourful! I have an open mouth now! mexican recipes are anyway close to me..they are so flavourful. Add dates and i am all set. They reallly combine well with spices, no really! They really combine well with spices, no really! I’ve been eating dates as snacks a lot recently, but I’ve rarely seen them used in savory food! Love what you’ve done with them here. Oh my this looks incredible! I have some dates hanging around that I need to use – now I have a recipe to use them in! 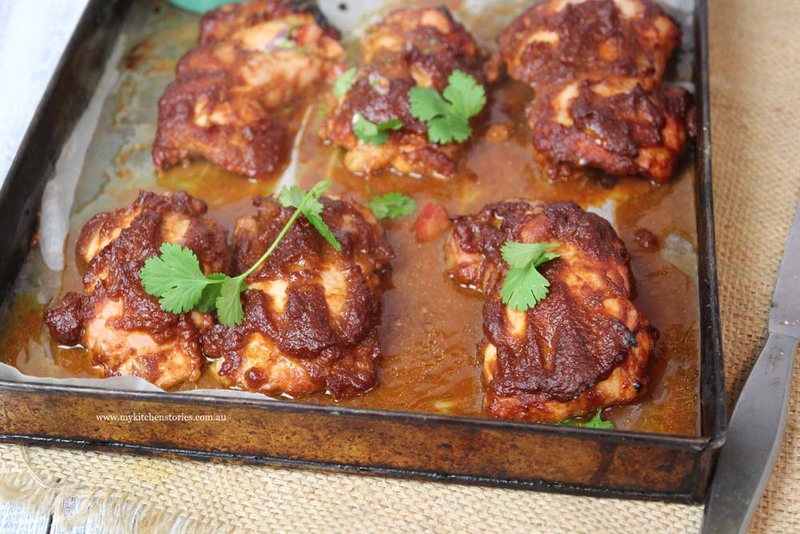 The chicken looks so juicy and packed with flavor – can’t wait to try it! I love dates to bits – especially the big, fat Medjool dates. But what a novel idea to use them in Mexican cooking! I wouldn’t have thought of that. Lorraine @ Not Quite Nigella recently posted..Warming Mulled Wine or Cider In The Slow Cooker! Your photos are gorgeous. Dates are a very versatile ingredient.